If you want to learn a new language, you do not have to sign up for expensive courses or join new classes in your University. There is an equally effective and interesting method to learn new languages. The method is of course using this app called Duolingo. The service was started a long time back and the Android app was introduced on May 29, 2013. Duolingo brings in innovative ways to help you learn new languages. The current list of languages that this app teaches you are Spanish, French, German, Portuguese, Italian, and English. This is a free app, so you can give it a try without any hesitation. Just create an account after you install this app and you begin the learning process immediately. 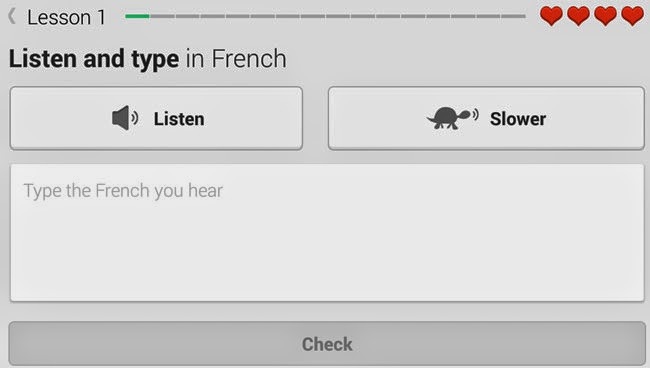 This app teaches you a new language with its quiz like interface. You are shown words, phrases and even sound clips are played in another language. You will have to identify what it means. There are several lessons that you must progress through. You can practice your newly learned words as well. You are given skill points as you learn a language. Skill points are dependent upon your accuracy to answer to those skill questions targeted towards testing your grasp of the new language. Step by step, you will slowly be learning a new language. This is the best way there is to learn a new language on your phone or tablet without spending anything. Duoligo app was previously available for Android Phones and iPhone. It did supported tablets but with a stretched layout. This means that the extra space that the tablets provided was not effectively used. Now, Duolingo is available natively for tablets. That means a native tablet application that make use of the effective screen space on those big devices.